There once was a time, way back in the days before the start of the 2018 NCAA tournament, when it was reasonable to consider the outcomes of some games locks. Those were the games between No. 1 and No. 16 seeds, which had gone to the favorites each and every time since the tournament expanded to 64 teams in 1985. Then last March UMBC toppled Virginia and the one thing that seemed sure this time of year was taken off the table of certainty. No. 2 Kentucky over No. 15 Abilene Christian: The Southland champs will not be the first team to send a John Calipari-coached Kentucky team home on the first day. No. 2 Michigan State over No. 15 Bradley: As long as Tom Izzo isn’t haunted by Middle Tennessee flashbacks, the Big Ten’s double champs will roll. No. 3 Texas Tech over No. 14 Northern Kentucky: No disrespect to the Norse, but not even the Horizon League’s best offense will be enough to get past the Red Raiders’ aggressive, smothering D.
No. 3 Houston over No. 14 Georgia State: The underdog Panthers were the Sun Belt’s worst rebounding team on both ends, meaning any swing in scoring chances—one potential means to an upset—is likely to favor the higher-seeded Cougars. No. 3 Purdue over No. 14 Old Dominion: Carsen Edwards can be too much for anyone to keep up with, especially a team that shoots a meager 44.5% from inside the arc. No. 4 Virginia Tech over No. 13 Saint Louis: With point guard Justin Robinson back from injury, the Hokies—who rank 11th in the country in overall adjusted efficiency—have too much talent to be sent home by one of the weakest offenses in the field. No. 4 Florida State over No. 13 Vermont: The Catamounts played respectably against Kansas and Louisville this year but the Seminoles’ size and athleticism is overwhelming for a team without a starter taller than 6’ 6”. No. 6 Iowa State over No. 11 Ohio State: Though consistency has been an issue, the Cyclones have looked like a Final Four contender at times this season, while the Buckeyes stumbled through the Big Ten without beating any of its top five teams. No. 6 Buffalo over No. 11 St. John’s or Arizona State: The Bulls can dominate the Johnnies on the boards and won’t be fazed by the Sun Devils’ uptempo pace. • SI's expert brackets are locked in. Who do we predict will cut down the nets? • Everyone has a story of when their bracket ripped our their heart and stomped on it. These are ours. 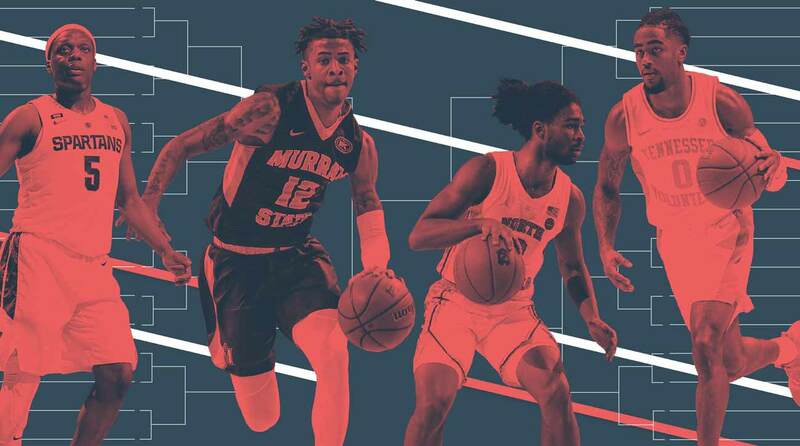 • College football fans: Let Andy Staples take you through the 2019 bracket in terms you can understand. Even without context, this is Coach Cal at his best. With context, it's still funny. Kentucky head coach John Calipari appeared on ESPN after the bracket reveal and referenced one of his favorite TV programs, Alaska: The Last Frontier, then claimed he could survive in the frigid wilderness. Mark Few, Gonzaga's head coach and a good friend of Calipari's, disputed the claim. "He literally couldn't last an hour in Alaska." This is March. SI's Dan Greene makes his picks for the initial First Four games and opening slate in the West Region. No. 16 Prairie View A&M over No. 16 Fairleigh Dickinson: The Panthers play fast (34th nationally in adjusted tempo) and fearless (they began the season with 12 straight road games) and are one of the most experienced teams in the field. No. 11 Belmont over No. 11 Temple: Rick Byrd finally gets his NCAA tournament win as the nation is introduced to 6’ 8” senior forward Dylan Windler, a double-double machine with NBA hopes. No. 1 Gonzaga over No. 16 Fairleigh Dickinson/Prairie View A&M: No 16 seed would have an answer for Zags’ lethal 6’ 8” forward combo Brandon Clarke and Rui Hachimura. No. 8 Syracuse over No. 9 Baylor: The Orange have the zone knowledge to not let the Bears make them uncomfortable as Jim Boeheim again wins in March with a middling offense. No. 12 Murray State over No. 5 Marquette: Markus Howard-led Golden Eagles won’t be upset easily, but Ja Morant can put a team on his back. No. 4 Florida State over No. 13 Vermont: See lead item above. No. 6 Buffalo over No. 11 St. John’s/Arizona State: See lead item above. No. 3 Texas Tech over No. 14 Northern Kentucky: See lead item above. No. 10 Florida over No. 7 Nevada: Wolfpack got a tough draw in an SEC-tested No. 10 seed who can match their athleticism. No. 2 Michigan over No. 15 Montana: The Grizzlies were hammered by their only major-conference opponents, Creighton and Arizona, neither of whom made the field. We'll leave you with a snapshot of a basketball player you may have heard of. Here's Michael Jordan making the game-winning shot for North Carolina against Georgetown in the 1982 title game. SI's Heinz Kluetmeier captured the photo below.